Aunt Elisabeth was a great cook, and she always was willing to share her German recipes with all of us. I already posted her recipe for Beef Roulade, which is my husband’s favorite beef dish. Today I will post her recipe for Zwiebel Kuchen, which her daughter absolutely loves, and it’s a must on her birthday menu. It is also a great dish to be included in a brunch menu, light lunch, or dinner, as well as for parties. Great for Octoberfest parties!! The crust may be made from scratch, but for a quicker version, she uses crescent roll ready made dough, as in this recipe. The light creamy texture of the filling and the sweetness of the sauteed onions with bacon flavor, makes this a delicious dish for any occasion. Yum! 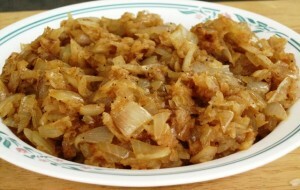 Fry onions to a golden color. 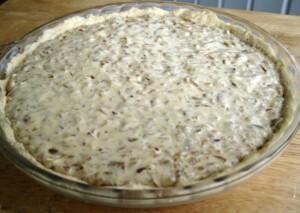 Place the dough in an ungreased, 10 inch glass pie dish, and press it down to cover the bottom and sides of the pan. 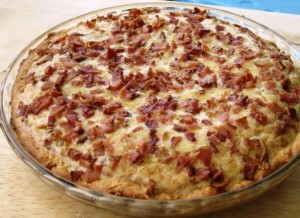 Sprinkle the bacon crumbs over the top of the mixture. Once baked, remove from the oven, and let it cool in the baking dish on a wire cooling rack. It is best to serve this dish nice and hot. Enjoy! In a large saucepan, fry the bacon, until fairly crispy. Remove, and set aside to cool. Once cooled, crumble it up, and set aside. Leave about 2 Tbs of bacon fat in the pan, and add the chopped onions. Remove from stove, and set aside to cool. 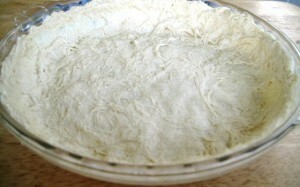 Remove the ready made crescent dough from a container. Spread on a lightly floured work area, and roll it out to form a circle, about 1 inch larger than the pie dish to be used for baking. In a medium mixing bowl, add 3 eggs, and beat for a couple of minutes. Mix in sour cream (yogurt), chives, salt, pepper, caraway seeds, and half of the bacon crumbs. Add flour and baking powder, and mix to create a smooth pasty filling. Pour the mixture into the prepared pie shell, and smooth the top with the back of a spoon. Place in a preheated oven to 350 degrees. Bake uncovered for 45 minutes, or test it with a toothpick, by inserting it in the middle of the tart, and if it comes out dry, the tart is done. Remove from the oven, and let it cool in the baking dish, on a wire cooling rack. 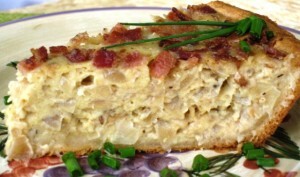 This onion cake/quiche/tart tastes great warm, as well as at room temperature. You may also make your own pie crust, use a ready made pie crust, Phillo Pastry, or make it crustless. For crustless tart, you will need to grease lightly the pie pan and sprinkle generously, the bottom and sides, with flavored bread crumbs. Also, you will need to cut down on the baking time by about 10 minutes. For best results, do the toothpick test. Yummy.. 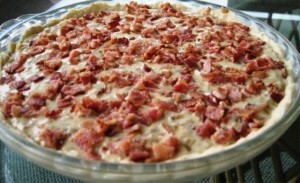 I will be making this but without the crust! thanks for sharing! I am sure you will love it. I also like it better without the crust.